As David notes, roasting the bananas in butter and brown sugar gives them a dark almost butterscotchy flavor and draws out their natural sweetness. You could make this recipe truly and completely dairy-free and vegan by using coconut oil instead of the butter and opting for a vegan chocolate. I did not include prep/total time for this recipe as ice cream machines all work at different speeds; do note, though, that the base must chill for at least four hours, and the finished ice cream another four hours. Slice the bananas into 1/2-inch (2 cm) pieces and toss them with brown sugar and butter in a 2-quart baking dish. Bake for 20-30 minutes, stirring just once during baking, until the bananas are browned and cooked through. Scrape the bananas and the thick syrup from the baking dish into a blender or food processor and set aside. In a small saucepan over low heat, warm the coconut milk, sugar, cornstarch and salt. Stir occasionally and continue heating until cornstarch has completely dissolved and mixture has thickened, about 5 minutes. It should look thicker and creamy at this point. Add the vanilla and lemon juice, and pour the mixture into the food processor to join the bananas. Blend until smooth. Chill the mixture thoroughly in the refrigerator for at least 3-4 hours and up to 1 day overnight, then freeze it in your ice cream maker according to manufacturer’s instructions. If the chilled mixture is too thick to pour into the machine, whisking will help thin it out. As the ice cream begins to firm (last few minutes of churning), add the chocolate bits and chopped walnuts. Transfer to a freezer container and freeze to firm up, about 4 hours. 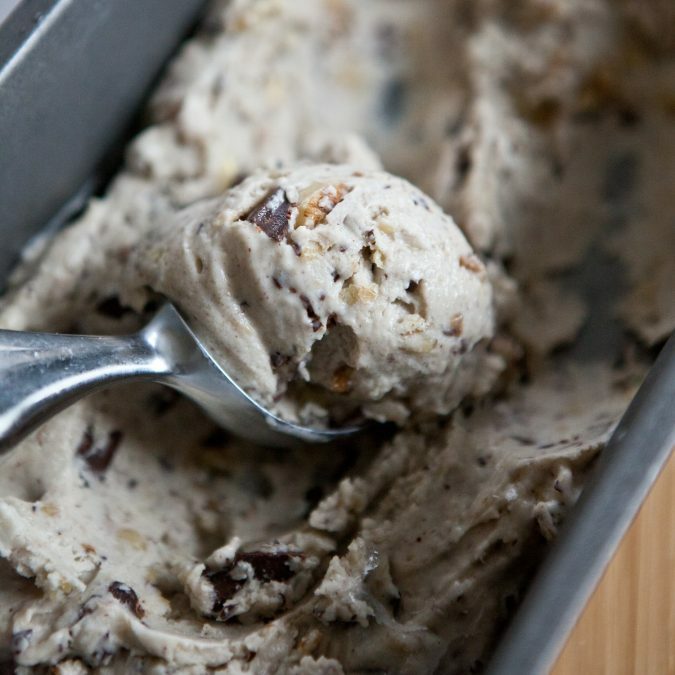 To serve: allow the ice cream to soften a bit at room temperature before serving, a good 5 minutes. This will make it easier to scoop.